At the 2017 Pride Parade. With God's help, we can do great things! 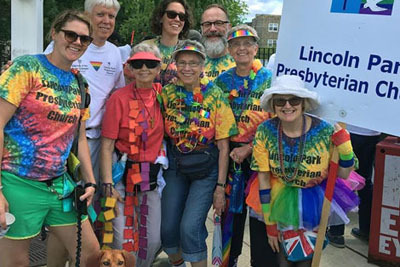 At Lincoln Park Presbyterian Church we strive to demonstrate the open, inclusive and accepting love of Jesus Christ. We pray, sing, study and worship in old ways and new, inviting families of all sorts – singles, couples, and children – to nurture their faith in a growing and vibrant congregation. We promote God’s justice and peace in our community and in our world. We seek the call of God to the next big thing and pray mightily that we receive the gifts to heed the invitation.